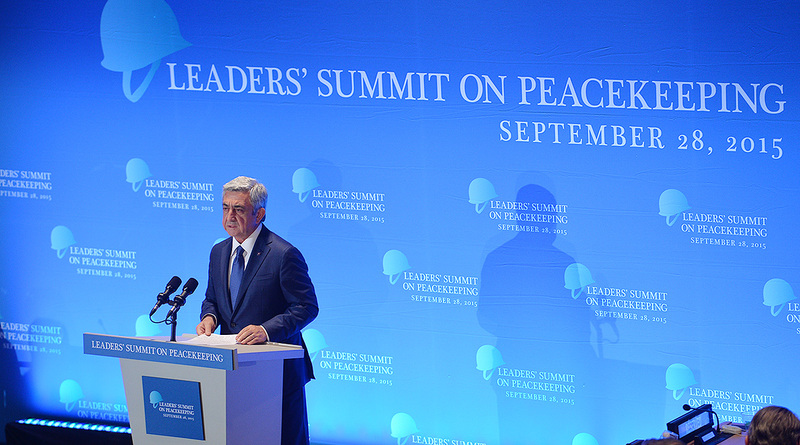 President Serzh Sargsyan, who has arrived in the United States of America to take part in the 70th session of the UN General Assembly, participated in the UN Summit on Peacekeeping Operations on 28 September in New York, where he made an address. 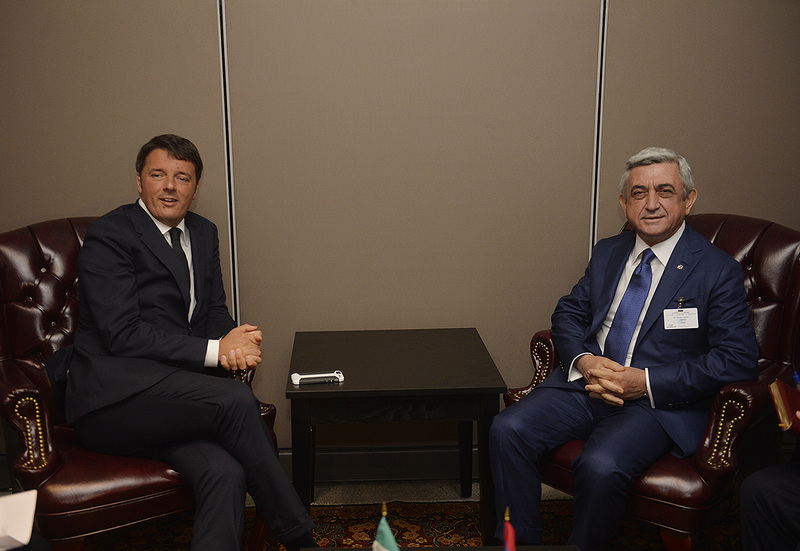 President Serzh Sargsyan, who has arrived in the U.S. on a working visit, had a meeting with Italy’s Prime Minister Matteo Renzi on September 28 in New York. 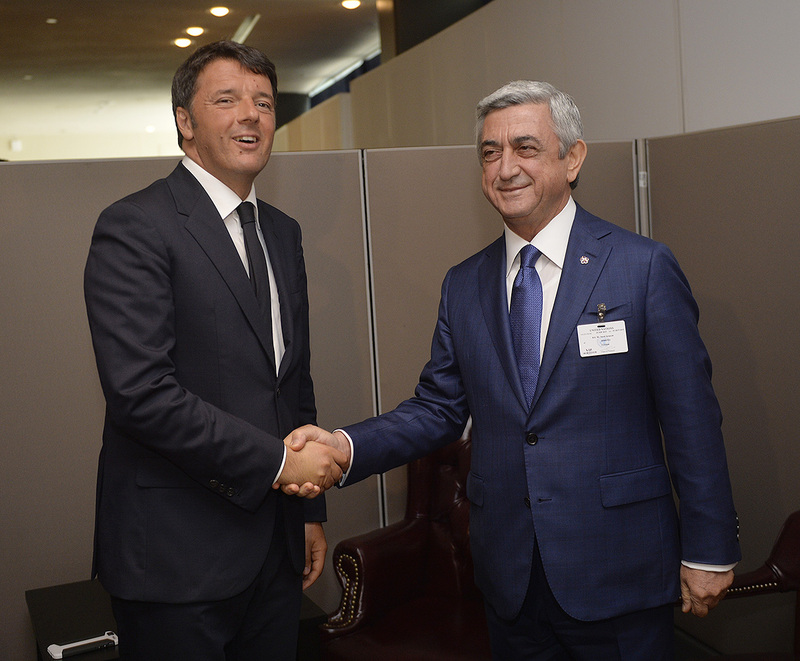 Serzh Sargsyan and Matteo Renzi discussed a broad range of issues pertaining to the political dialogue between Armenia and Italy and their trade and economic collaboration, and touched upon the two countries’ cooperation within the frames of international organizations. 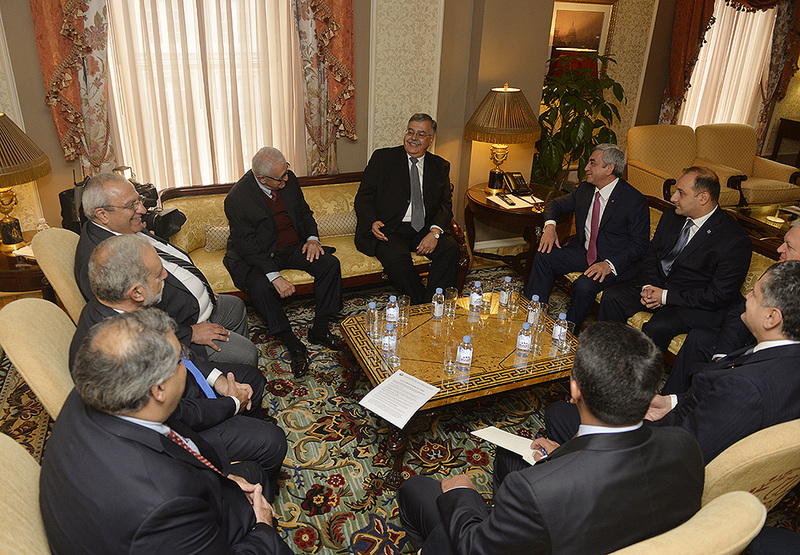 The interlocutors expressed their satisfaction with the fact that Armenian-Italian interstate ties have always developed in the spirit of mutual understanding. 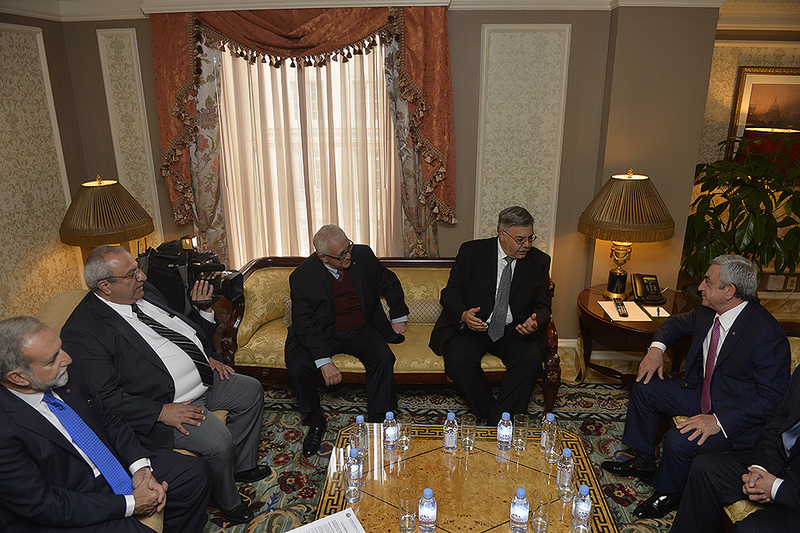 However, they stated that the two countries’ potential allows for further intensification of bilateral relations. The RA president and Italy’ prime minister attached importance to the promotion of stable political dialogue between the two countries, to which the interlocutors are sure frequent reciprocal visits could considerably contribute. 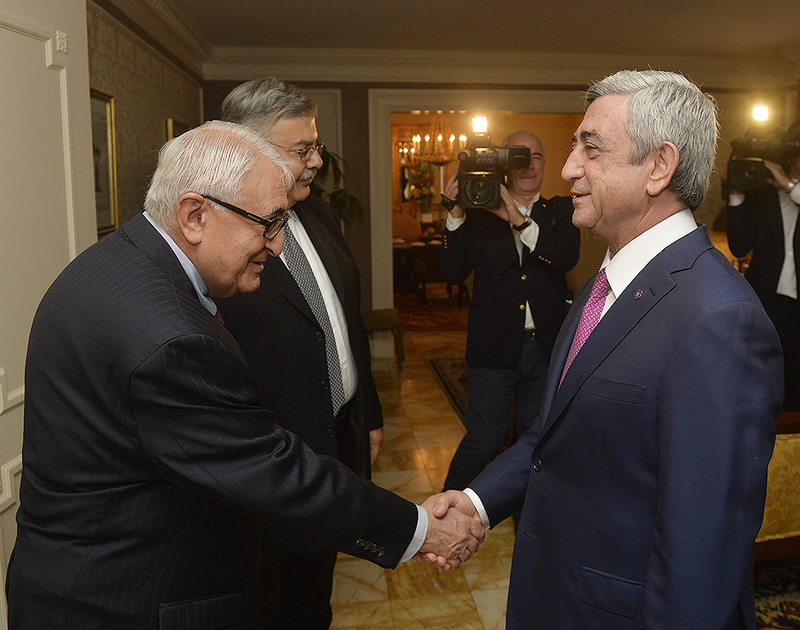 In that context, President Serzh Sargsyan warmly recalled his official visit to Italy in April this year and the meaningful and interesting meeting with President Sergio Mattarella. 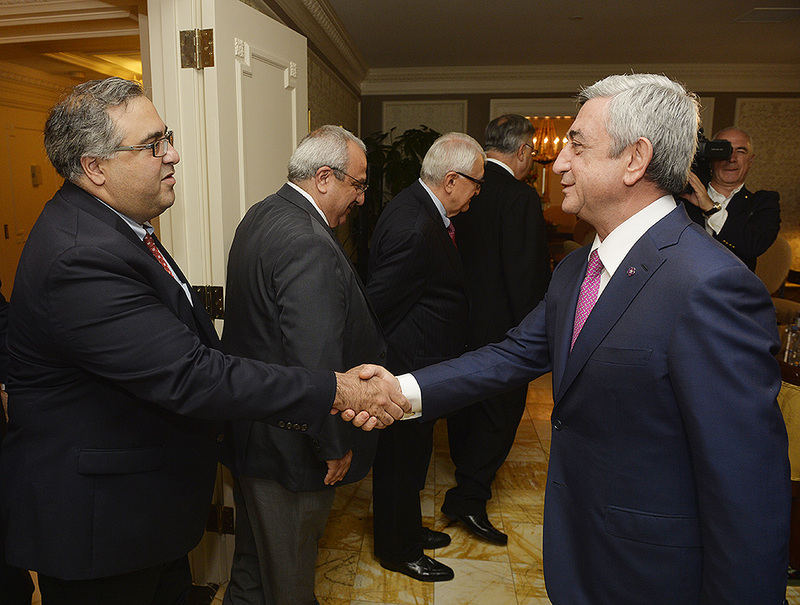 Armenia’s president stressed that through concerted efforts, the two countries can elevate Armenian-Italian interstate relations, as well as their cooperation within the frames of the EU to a qualitatively new level. 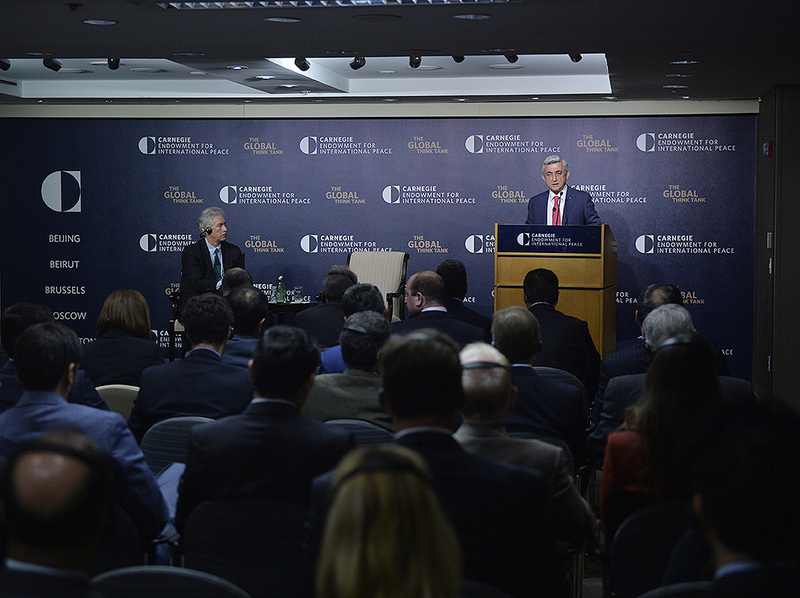 Serzh Sargsyan underscored that Italy is important to Armenia also as a leading EU country, and the promotion of comprehensive cooperation with it continues to hold a serious place in Armenia’s foreign policy agenda. 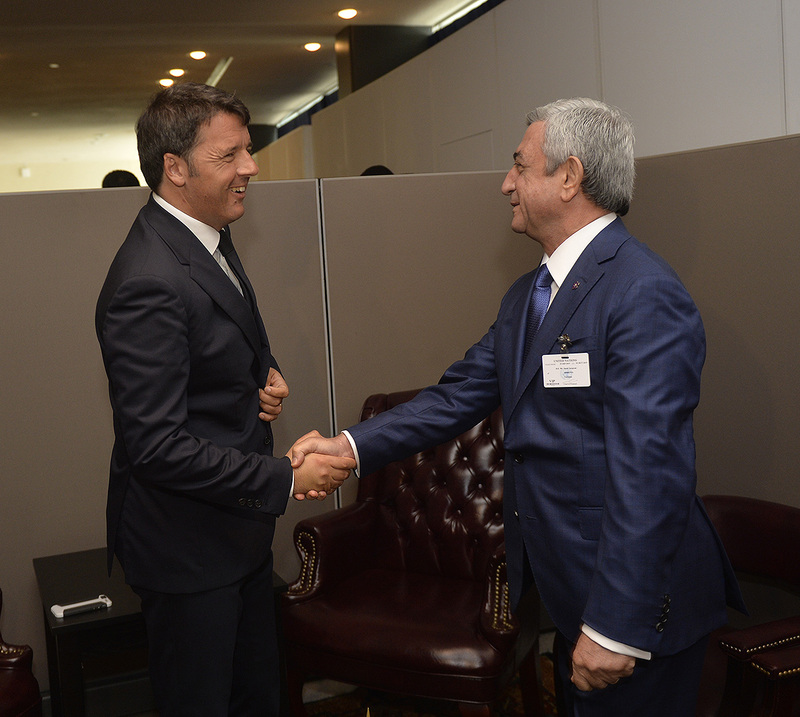 The president expressed the hope that Italy will continue to support the implementation of the current RA-EU agenda. 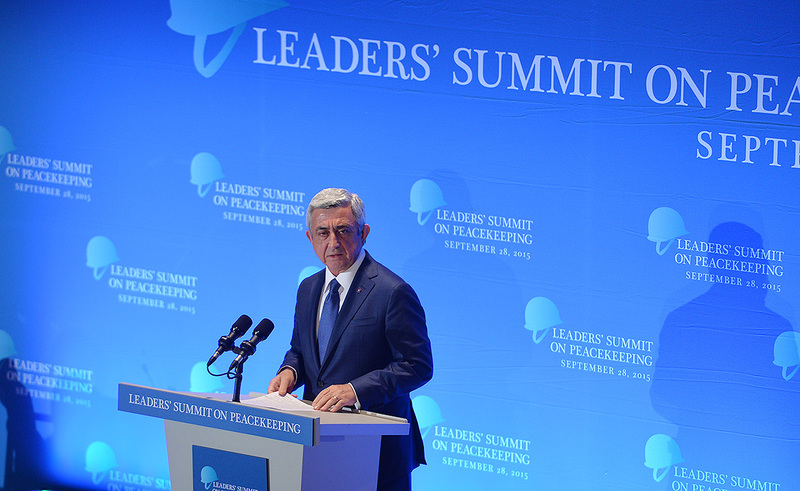 Armenia’s president placed importance on defense cooperation which has occupied a special place in the Armenian-Italian bilateral agenda since 2012, underlining that the defense cooperation is not limited to bilateral format: since last November, 32 Armenian peacekeepers have joined the UN peacekeeping forces under Italian command in Lebanon, which, according to the president, can truly be considered as a successful example of cooperation between Armenia and Italy. At the meeting, the RA president and the Italian prime minister attached importance also to the role of parliamentary diplomacy to develop bilateral relations. 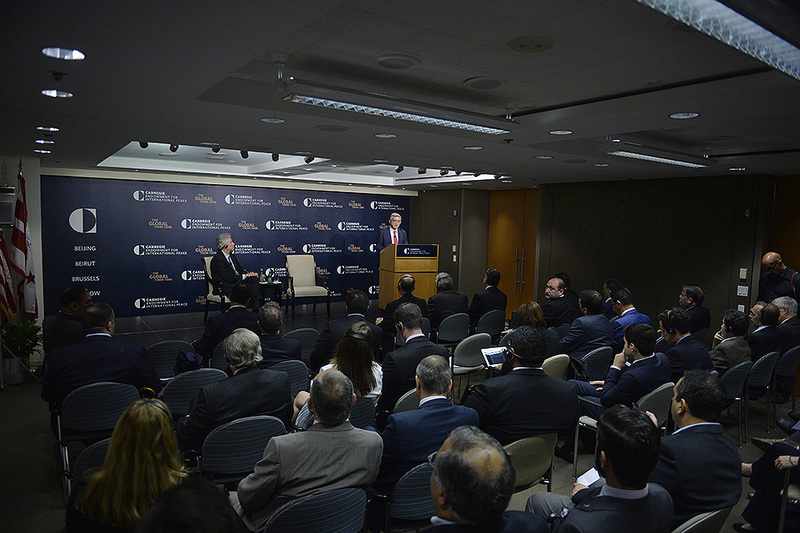 Noting that trade and economic relations are among vital components on the Armenian-Italian agenda, the interlocutors expressed satisfaction with the fact that in the last four years, despite the global financial and economic crisis, the two counties have witnessed considerable trade growth. Furthermore, according to the previous year’s indicators, Italy is the 2nd trade partner of Armenia among the EU countries (the first is Germany). 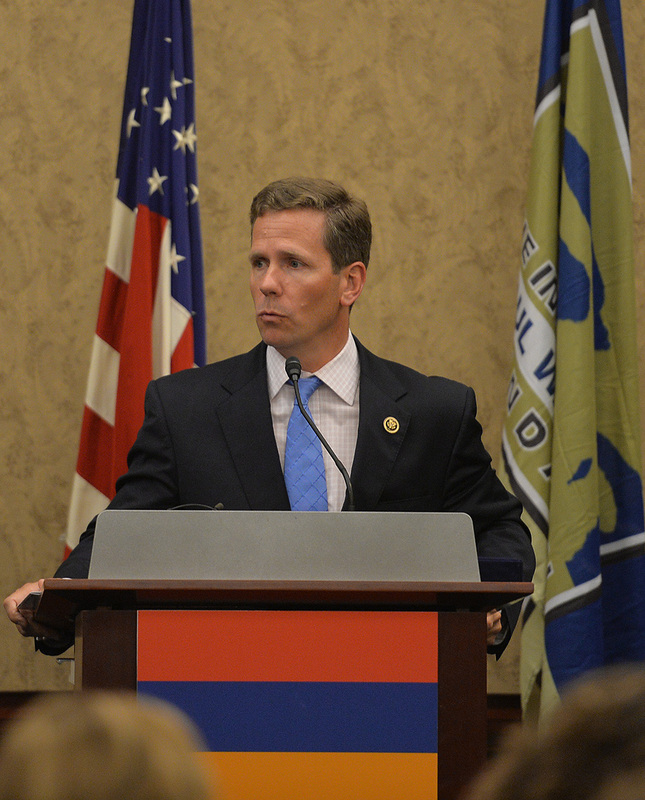 The parties were sure that this bears testimony to the fact that there is serious potential for better results, at which vigorous efforts need to be directed. 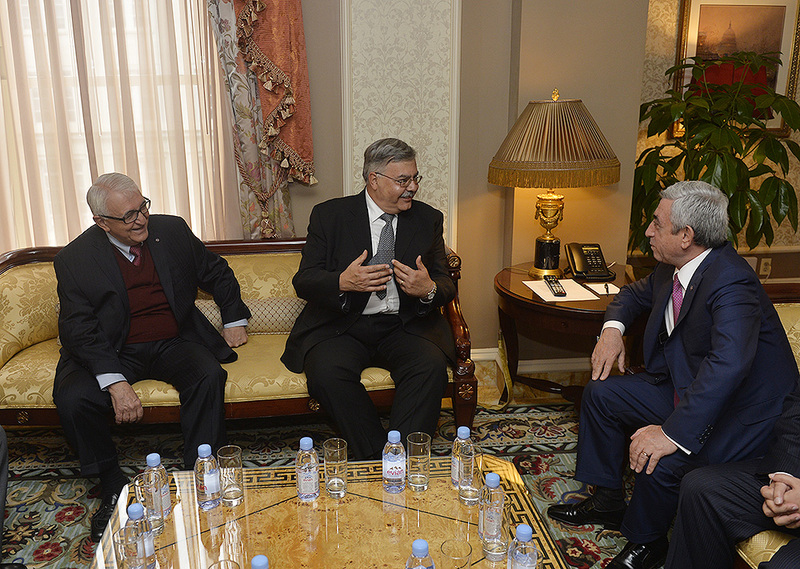 The RA president and Italy’s prime minister touched upon regional issues and challenges, including the current stage of the Nagorno-Karabakh peace process and the present problems. 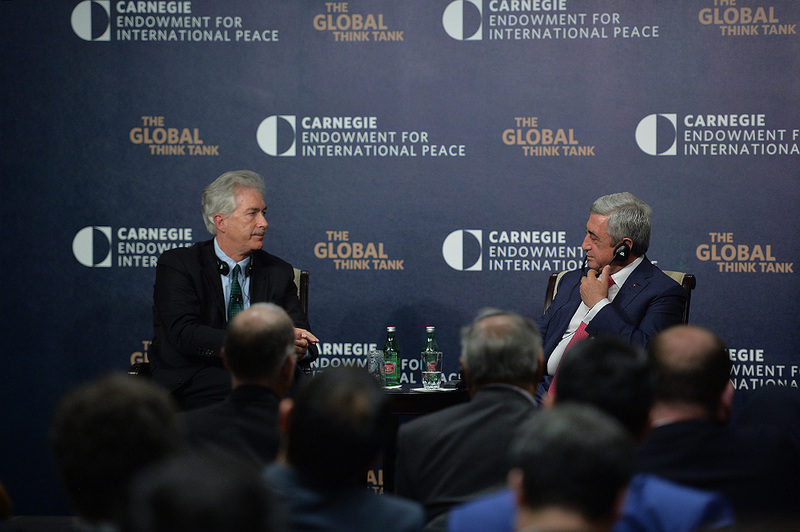 President Serzh Sargsyan stressed that as a friendly country, Armenia values Italy’s stable and balanced position on the NK conflict. 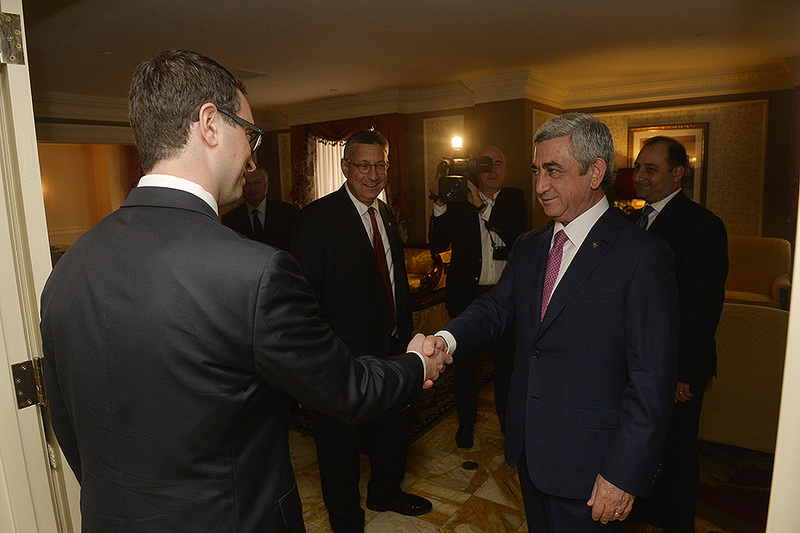 On September 28, Serzh Sargsyan also had a meeting with Prime Minster Stefan Löfvén of the Kingdom of Sweden in New York. The president spoke highly of the Armenian-Swedish cooperation, which, according to him, has experienced tangible development in recent years, marked by the active dialogue of foreign ministers, the increase in the number of embassies and by various reciprocal visits. The RA president and Sweden’s prime minister highlighted the special place of Armenian-EU relations and collaboration in the Armenian-Swedish cooperation agenda. 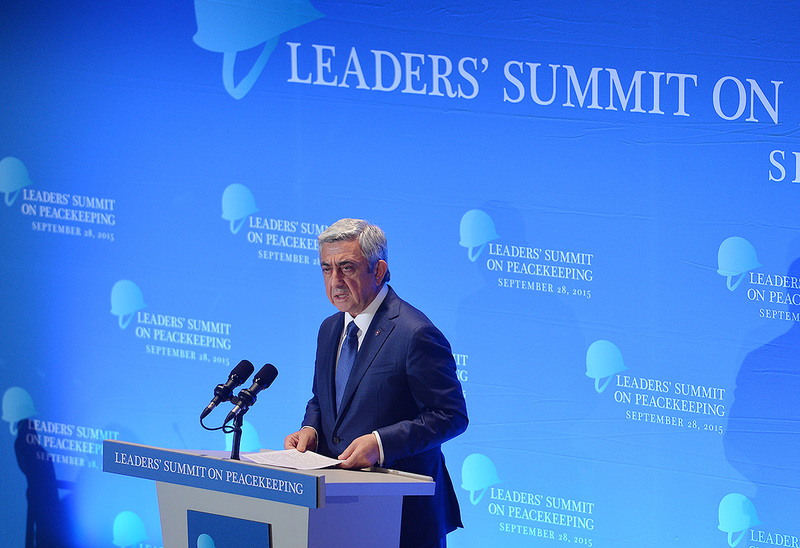 Armenia’s president stressed the role of Sweden, a co-author of the Eastern Partnership, in the reinforcement of Armenia-EU relations. The interlocutors talked about the need to develop bilateral trade and economic ties, stating that unfortunately, the current economic indicators do not correspond with the huge economic potential of cooperation between Armenia and Sweden. The parties agreed that in order to reveal the full potential, there is a need to foster mutual contacts and exchange of information at a state level, develop a comprehensive legal framework, and hold business forums. 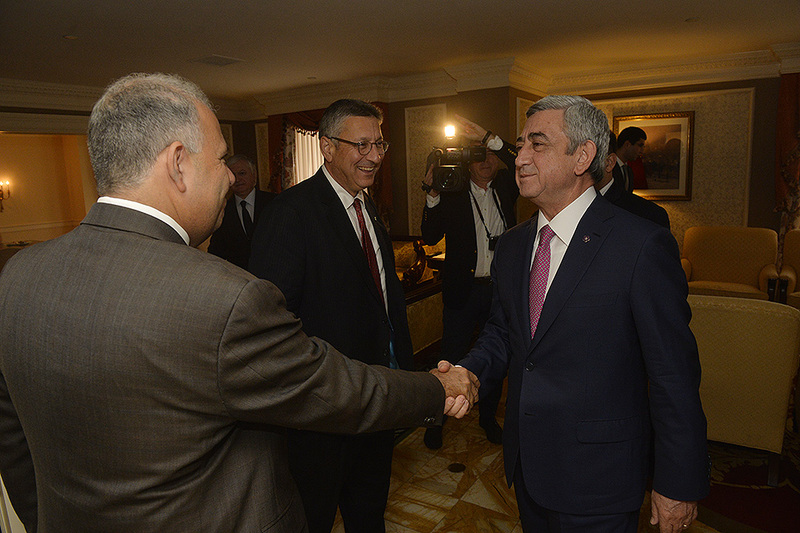 At the meeting, President Serzh Sargsyan attached importance to Sweden’s balanced position on the Nagorno-Karabakh peace process. 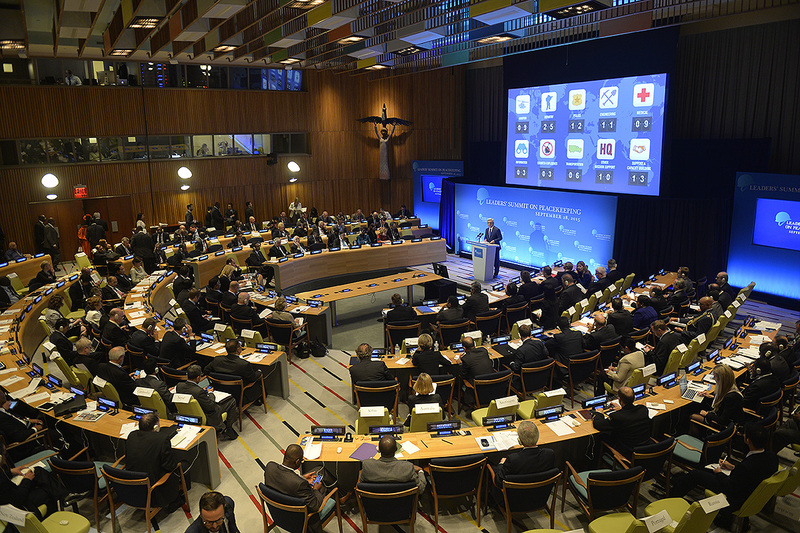 The parties also reflected upon issues pertaining to cooperation within the frames of international organizations. 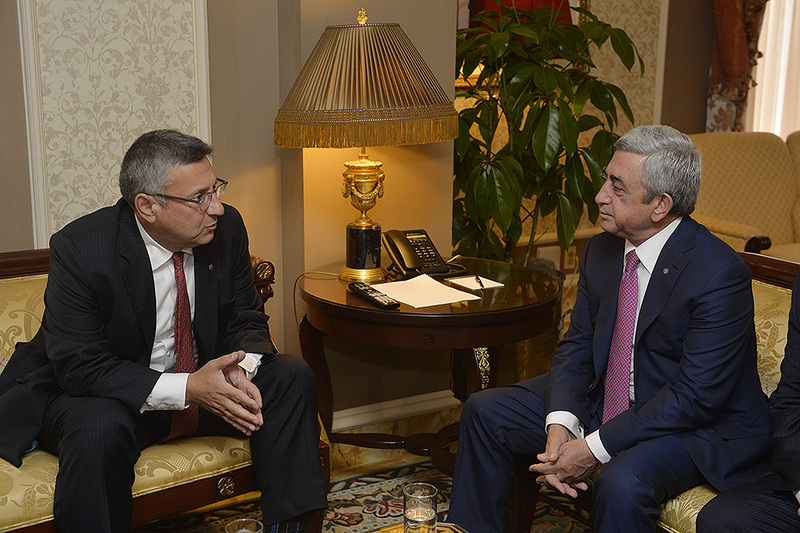 Serzh Sargsyan and Stefan Löfvén placed importance on the intensification of parliamentary cooperation between the two friendly countries. 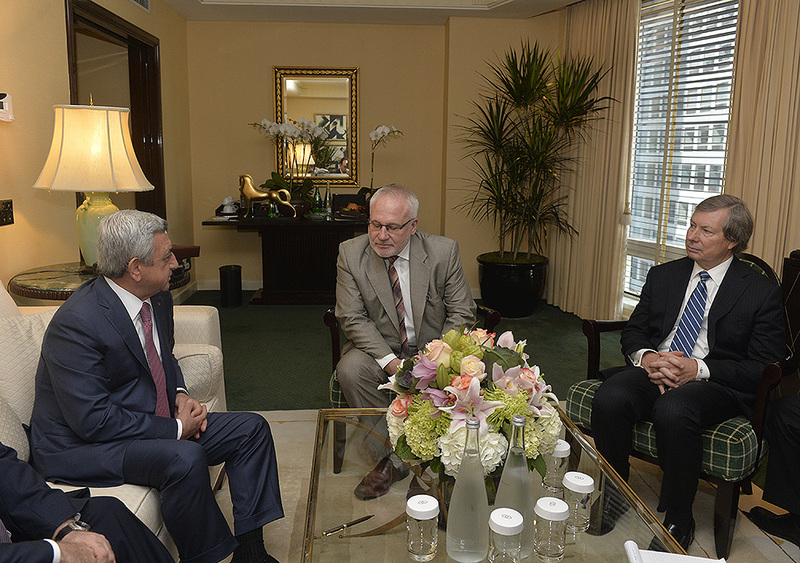 On September 29, in New York, President Serzh Sargsyan had a meeting with the Co-Chairs of the OSCE Minsk Group, Igor Popov of the Russian Federation, James Warlick of the United States of America, and Pierre Andrieu of France. 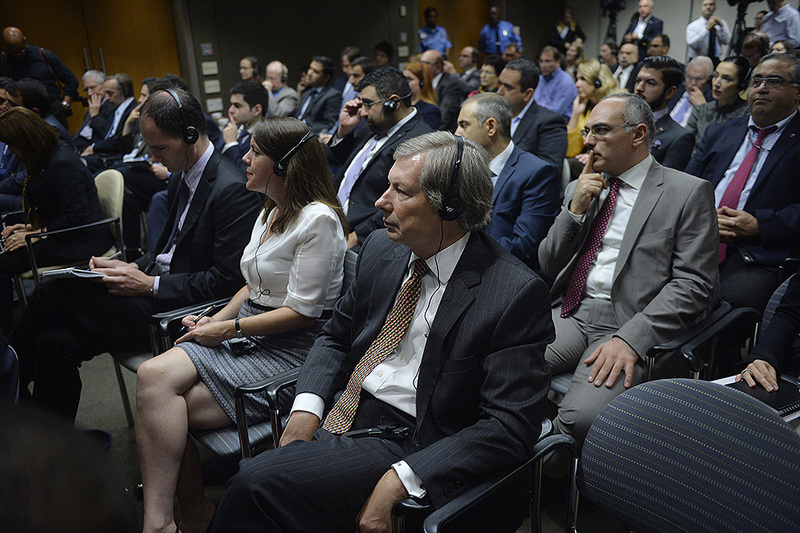 Andrzej Kasprzyk, Personal Representative of the OSCE Chairperson-in-Office, also joined the meeting. 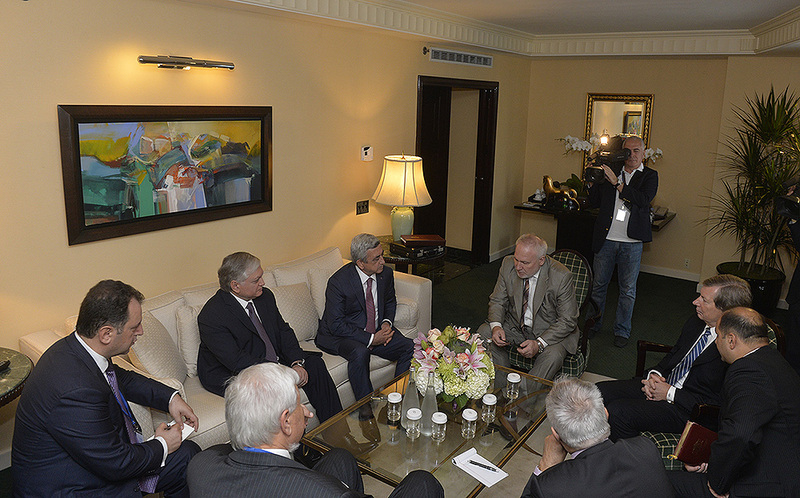 At the meeting, the interlocutors discussed the Nagorno-Karabakh peace process within the frames of the OSCE Minsk Group and the current concerns, particularly touching upon the tensions caused by the recent ceasefire violations. 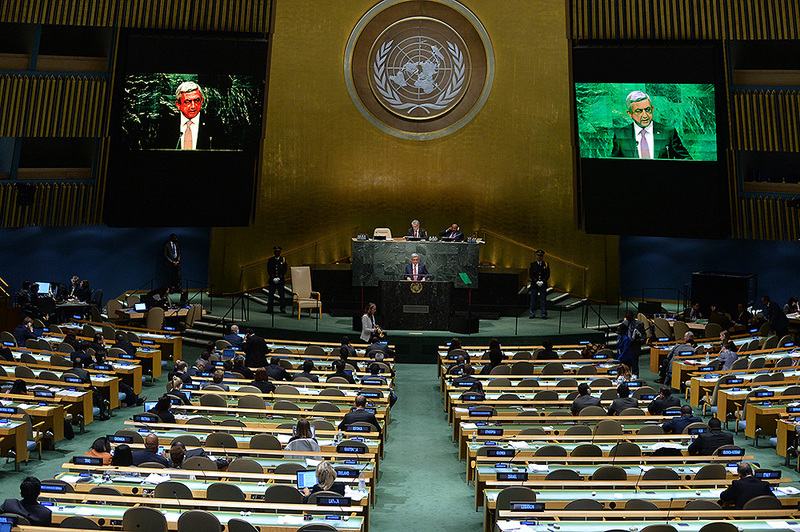 On September 29, President Serzh Sargsyan partook in the 70th session of the UN General Assembly in New York, where he made an address. 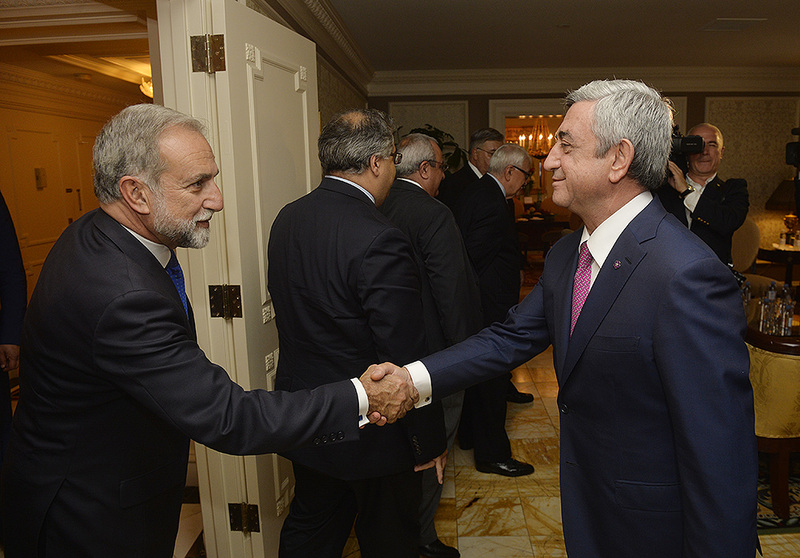 On the evening of 28 September, President Serzh Sargsyan took part in a reception in New York held by U.S. President Barack Obama in honor of the heads of country delegations participating in the 70th session of the UN General Assembly. 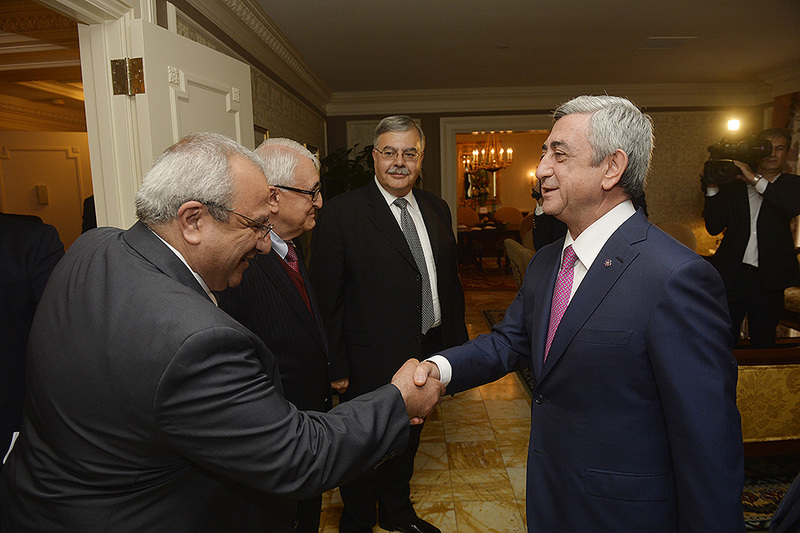 At the reception, Presidents Barack Obama and Serzh Sargsyan had a brief conversation during which they discussed issues of Pan-Armenian importance. 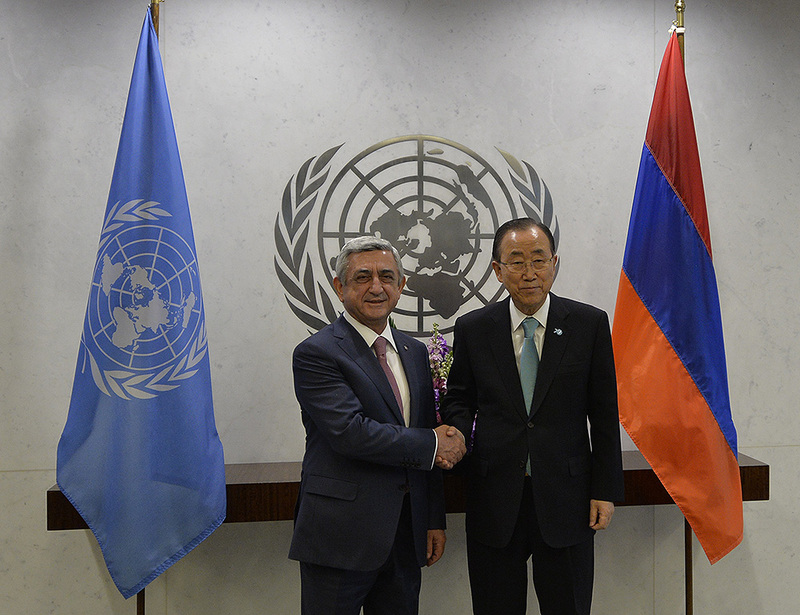 President Serzh Sargsyan, who has visited the United States of America to take part in the 70th session of the UN General Assembly, had a meeting with UN Secretary-General Ban Ki-moon on September 29. 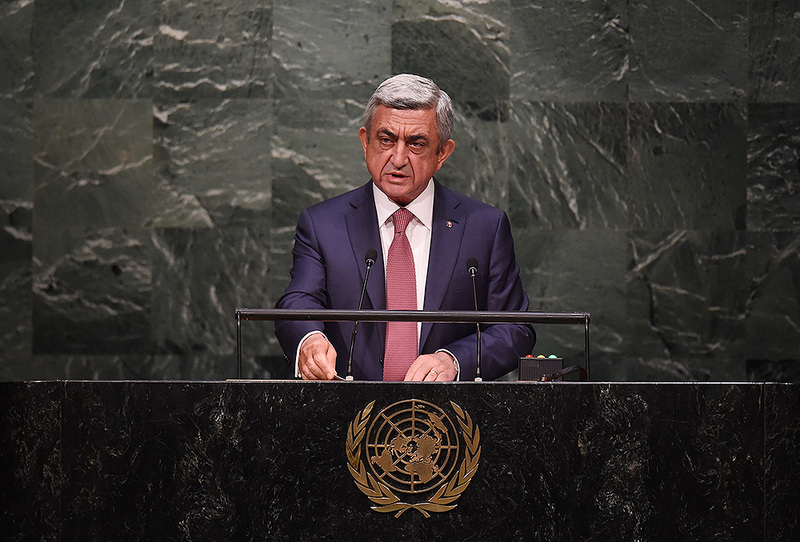 The president congratulated the secretary-general upon the 70th jubilee of the organization, stressing that when Armenia joined the UN 23 years ago, it has felt supported by the organization from the very first day. 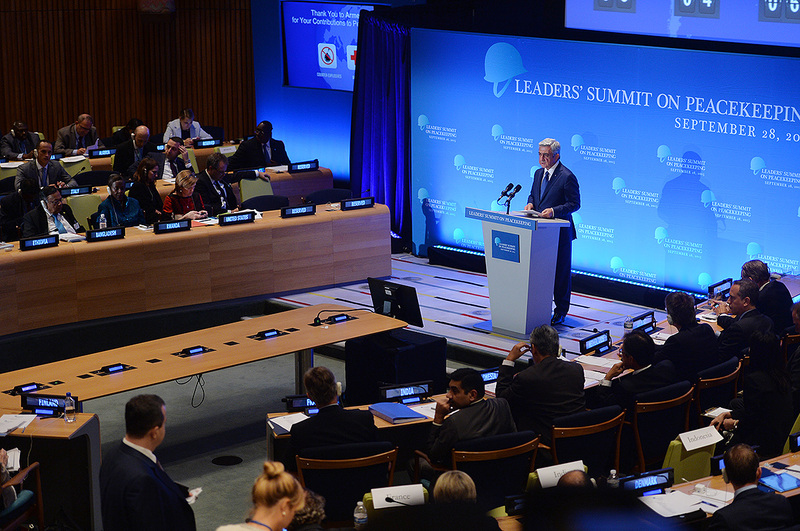 Serzh Sargsyan expressed his satisfaction with the successful end of the final summit of the program “Transforming our World: the 2030 Agenda for Sustainable Development” a few days ago, in which the UN secretary-general has played his role. 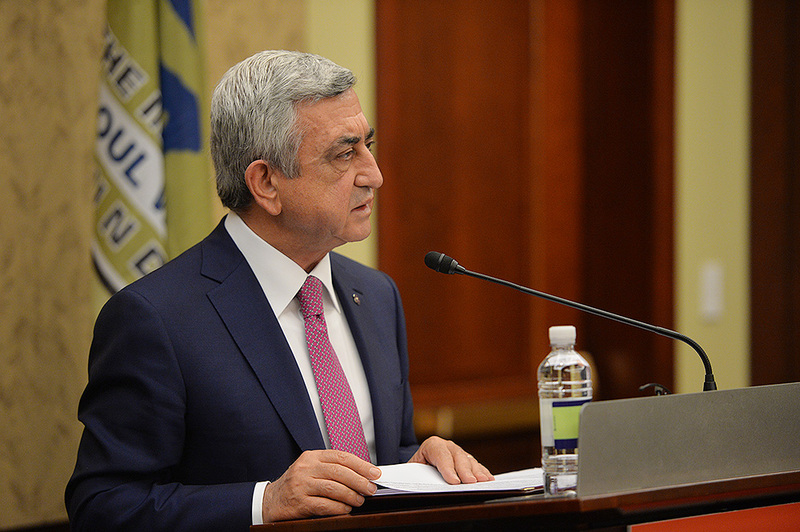 Armenia’s president expressed the hope that the new comprehensive program will help raise the quality of living conditions for all people on the planet. 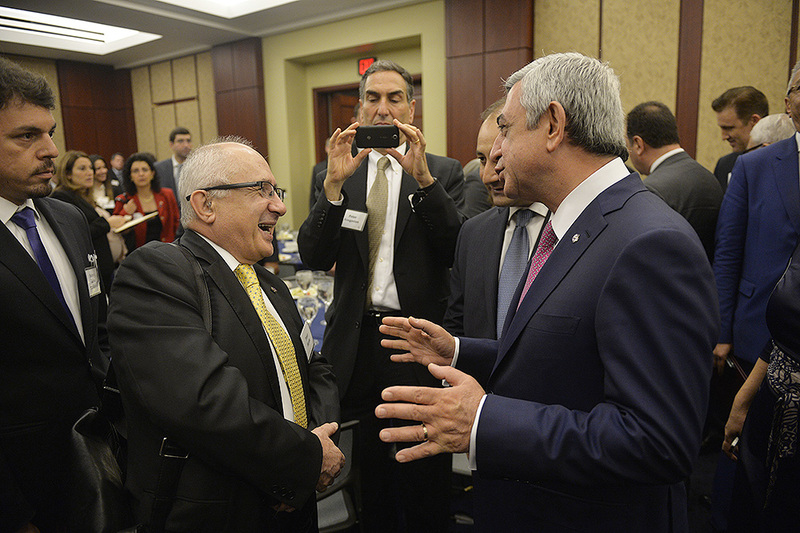 At the meeting, the parties touched upon the Nagorno-Karabakh peace process. 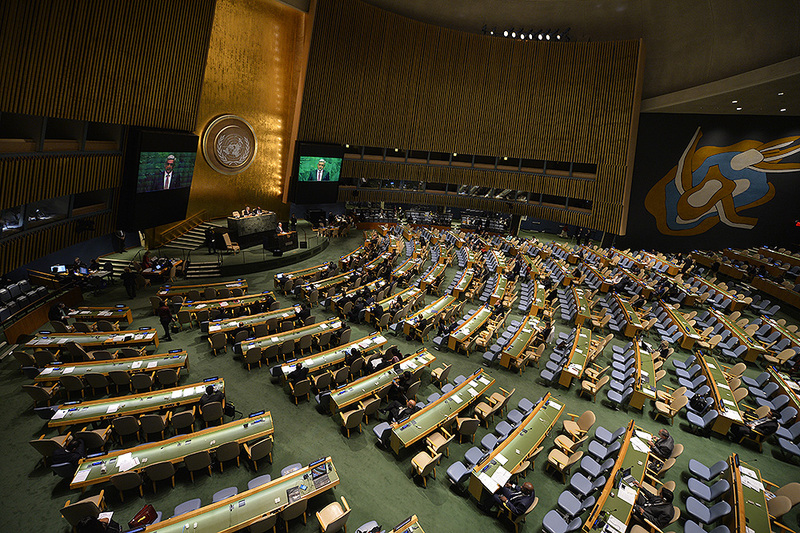 The president informed Ban Ki-moon about the current stage of the conflict, the present problems and especially about the tensions at the Armenian-Azerbaijani border and the contact line with Nagorno-Karabakh caused by the resent ceasefire violations of Azerbaijan, which he had also touched upon at the 70th session of the UN General Assembly. 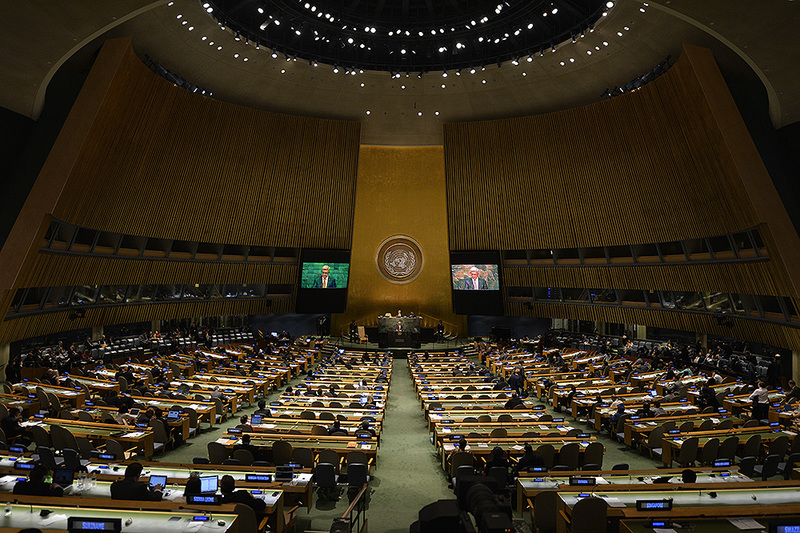 The UN secretary-general expressed his concern over the current tensions, stressing the need for a settlement mediated by the OSCE Minsk Group co-chairs. 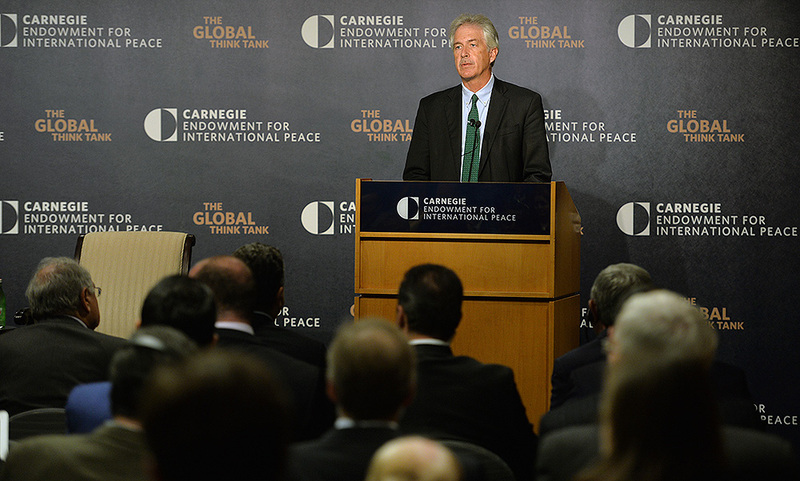 The interlocutors exchanged views on present-day international issues, and on worrisome events occurring in the world - new conflicts, increasing terrorism and extremism, the growing tensions in the Near and Middle East. 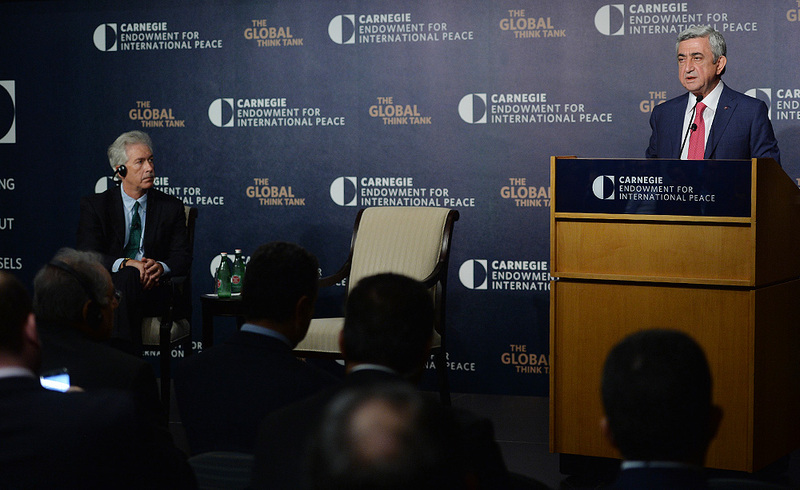 Ban Ki-moon welcomed and thanked our country for the steps to provide refugees from northern Iraq and Syria with safe haven in Armenia. 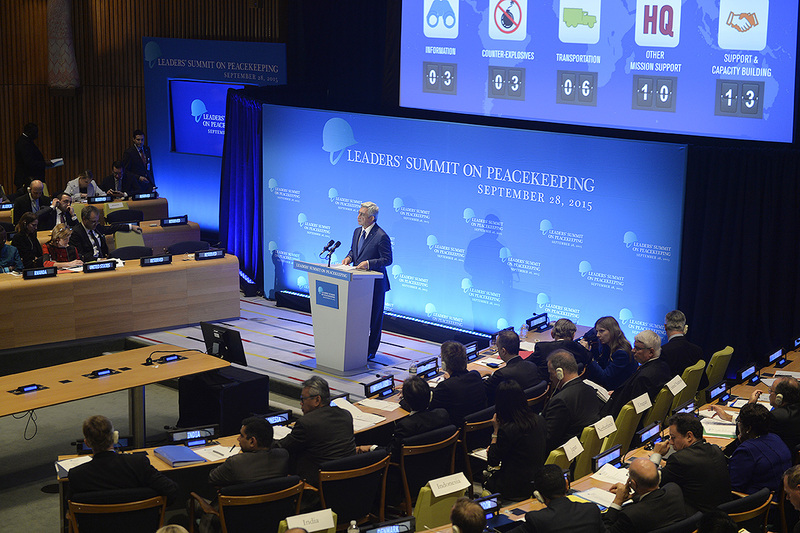 The UN secretary-general attached importance to the forum on global challenges of peacekeeping to be held in Yerevan in the near future. 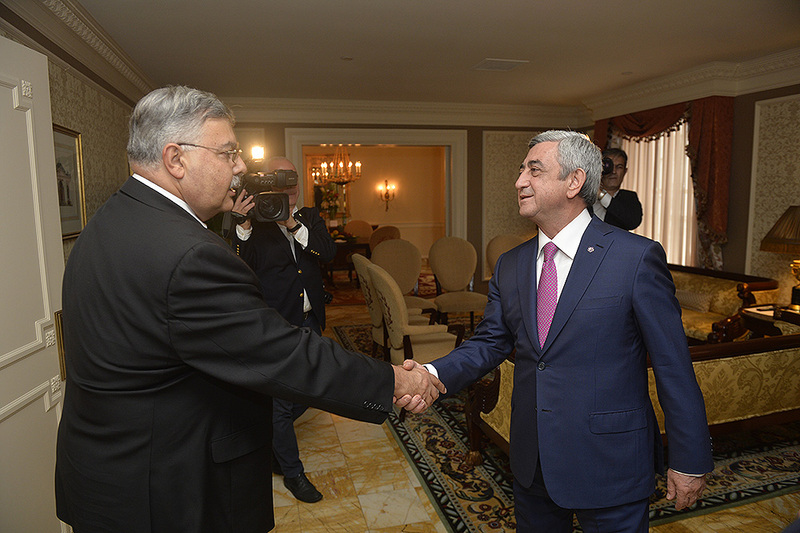 President Serzh Sargsyan, who has paid a working visit to the United States of America, had left New York for Washington on the evening of 29 September. 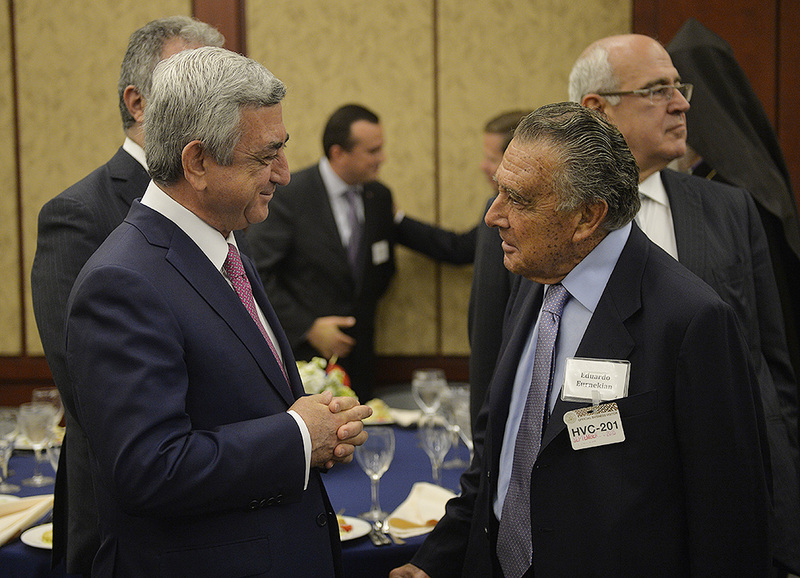 On 30 September, the president took part in a reception held by the International Raoul Wallenberg Foundation at the United States Congress in honor of the RA president. 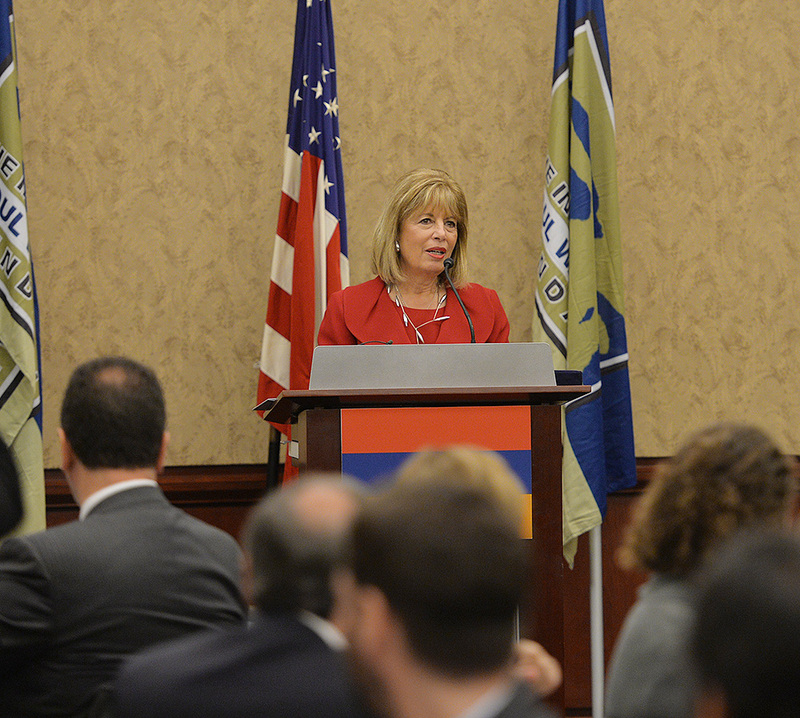 Apart from foundation representatives, the reception was attended about two dozen congressmen, e.g. 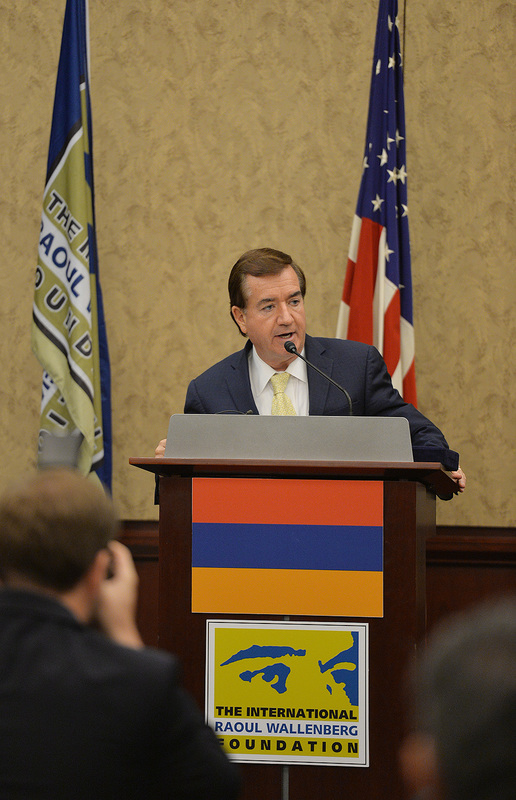 Ed Royce, chairman of the U.S. House Committee on Foreign Affairs, Congressmen Adam Schiff, Brad Sherman, Jackie Speier, Robert Dold, Jim Costain-Dave Trott, David Valadao, Judy Chu, and by some influential representatives of the Armenian community. 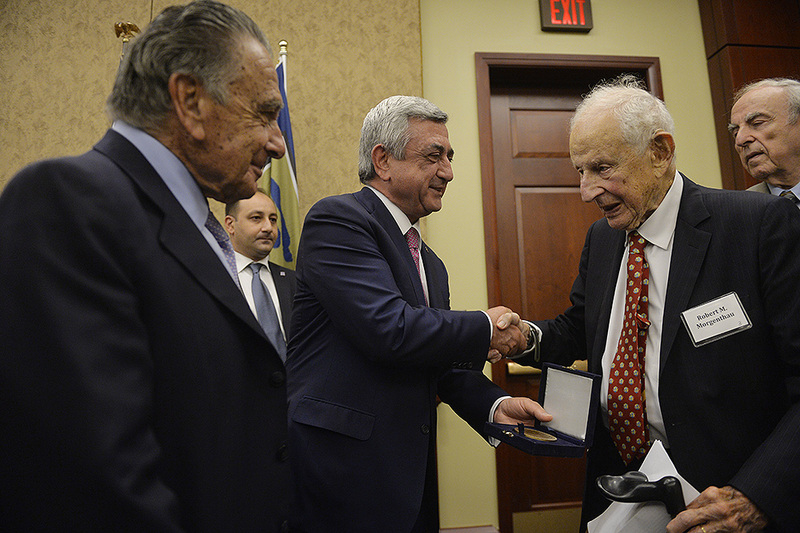 During the congressional reception, the RA president made an address at the end of which the foundation members handed over the Raoul Wallenberg Foundation Medal to Morgenthau’s grandson Robert Morgenthau. 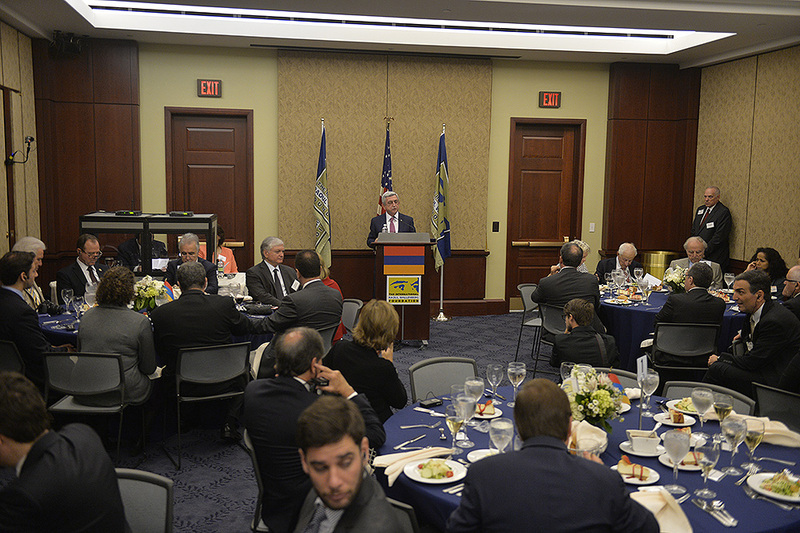 The congressmen and the other guests welcomed the RA president and stressed that as friends of Armenia and the Armenian people, they will thenceforth continue to stand beside Armenia to help deal with its vital problems and contribute to the development, strengthening and well-being of Armenia. 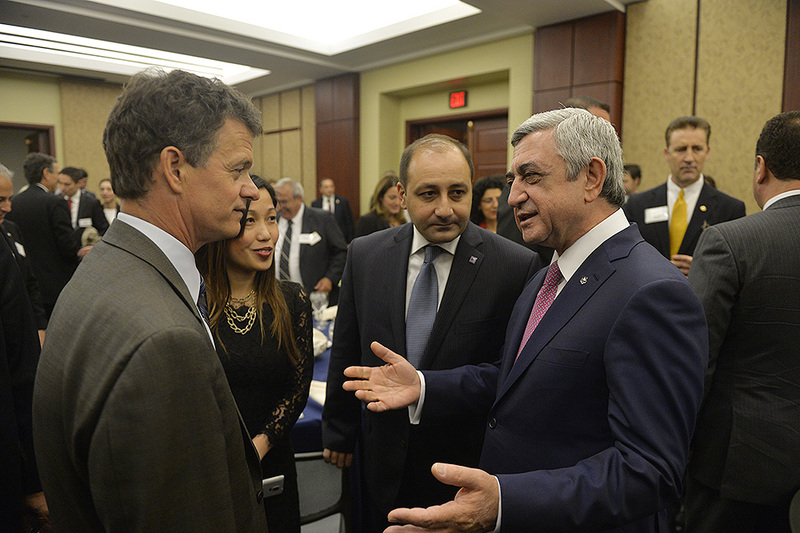 On September 30, President Serzh Sargsyan had meetings in Washington with the executives of the Armenian Assembly of America and with the leadership of the Armenian National Committee of America and the ARF representatives of the U.S.A. East Coast. 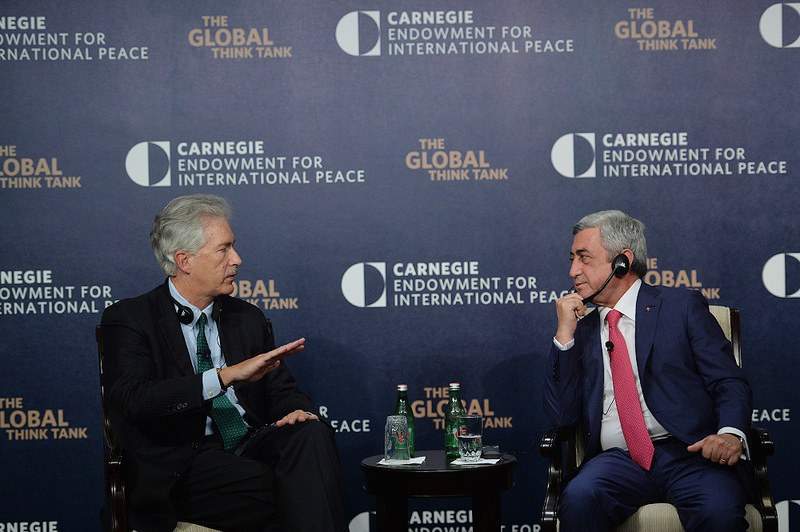 Armenia’s president welcomed and attached importance to the activities of the American-Armenian organizations which have always been engaged in dealing with issues of Pan-Armenian importance, discussed the current activities of the aforementioned organizations and also issues pertaining to their prospects, taking into account the new realities and challenges emerging in the rapidly changing world that require fresh, adequate approaches and actions. 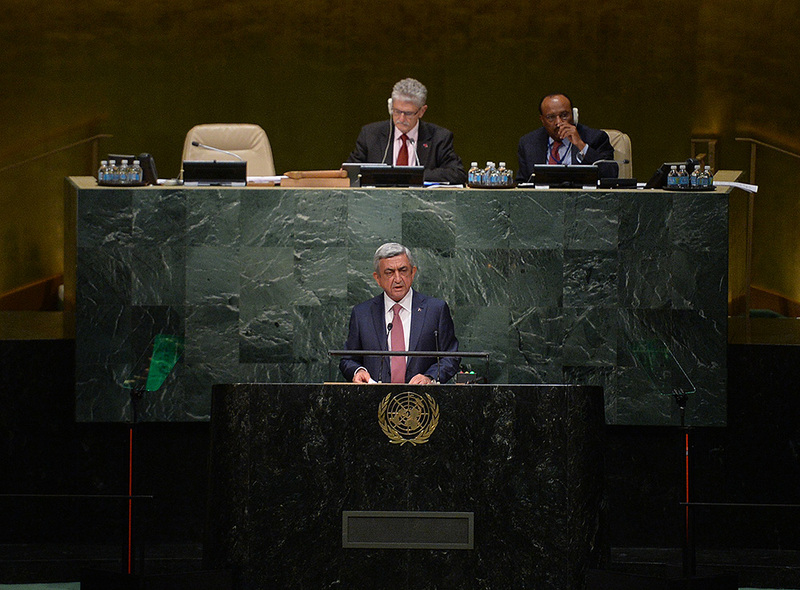 Serzh Sargsyan presented the meetings he had had during his working visit to the U.S. and the main points of his address at the 70th session of the UN General Assembly, touched upon the tensions at the Armenian-Azerbaijani border and at the contact line with Nagorno-Karabakh caused especially by recent ceasefire violations of Azerbaijan, and also responded to questions from the participants. 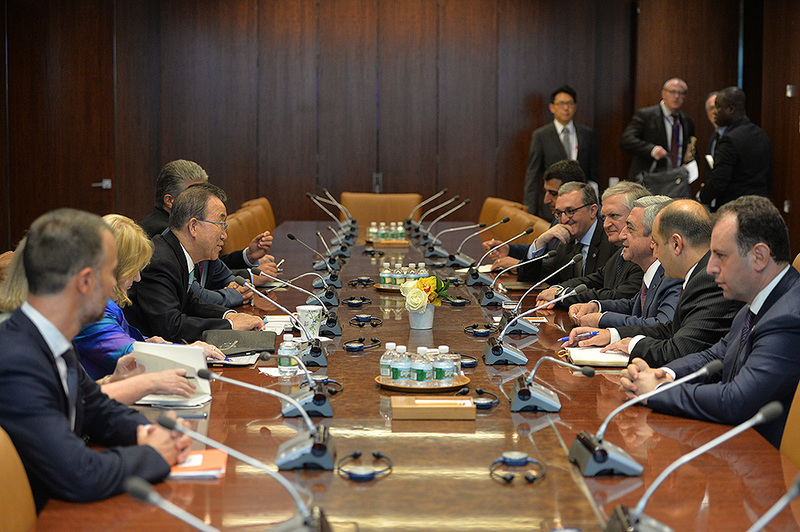 During the aforementioned meetings, the parties reflected upon the situation in the Middle East. 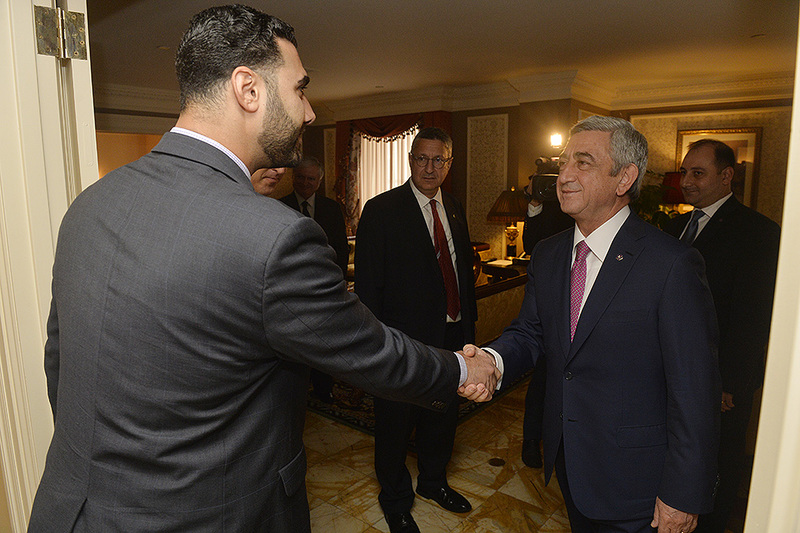 The representatives of the Armenian organizations thanked the Armenian president for showing a caring attitude towards the issues to support Syrian-Armenians, giving shelter to our compatriots in Armenia and also for trying his best to support Armenians in Syria. 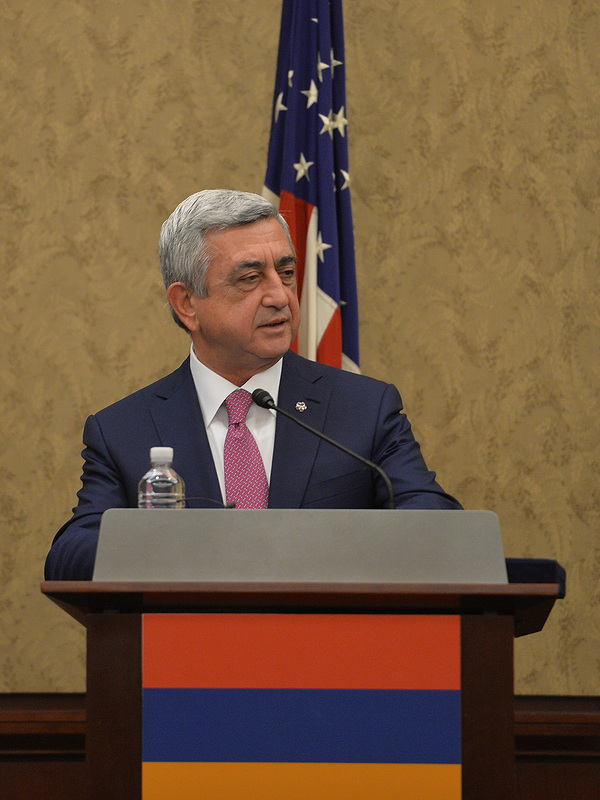 On the evening of September 30, President Serzh Sargsyan will also meet with representatives of the American-Armenian community at the Embassy of the Republic of Armenia in the U.S.A.
On the last day of his working visit to the U.S., October 1, Serzh Sargsyan took part in a “reference-free” discussion held by the Carnegie Endowment for International Peace. 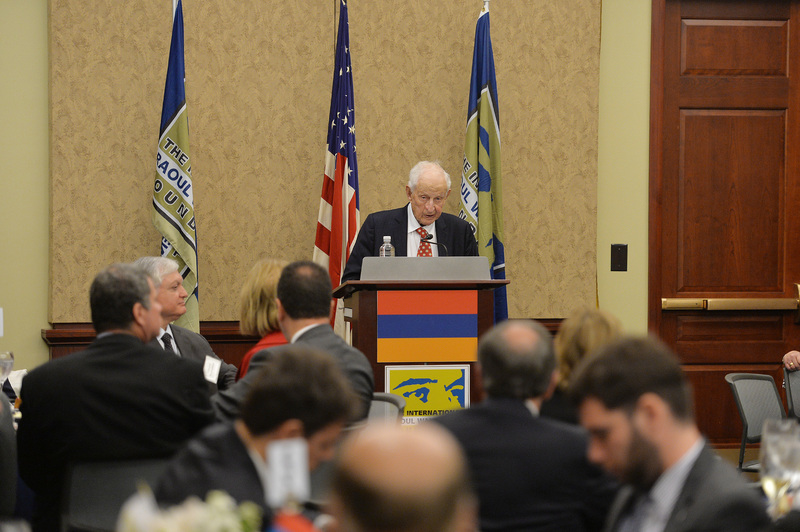 In his extensive speech to representatives of the U.S. expert community, the president touched upon the issues on Armenia’s foreign policy agenda, and the present-day international problems and challenges which pose a threat to peace and security. 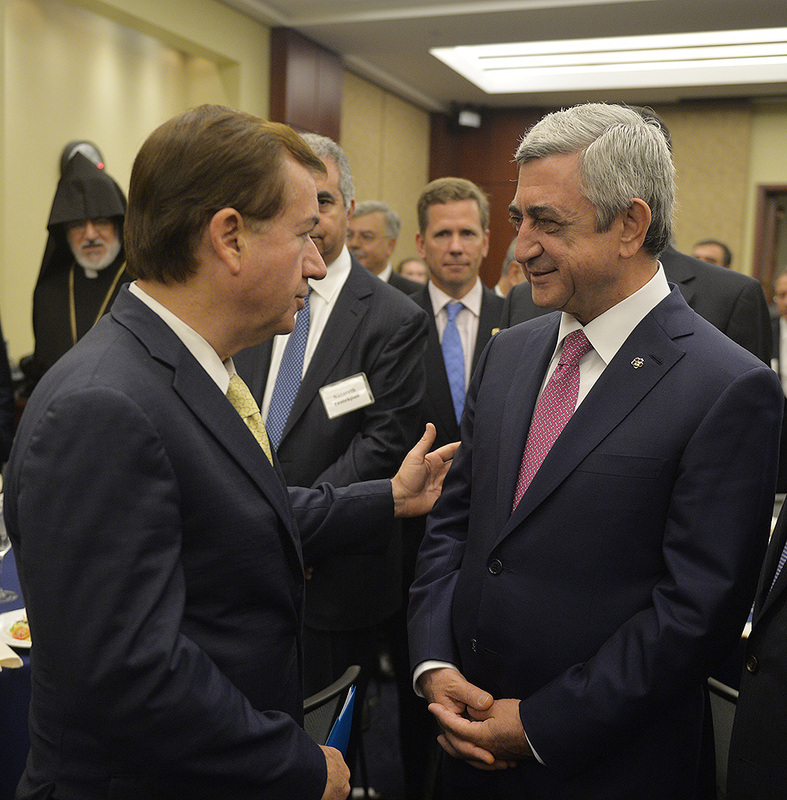 The president presented the problems existing at the current stage of the Nagorno-Karabakh peace process and the situation in the region. 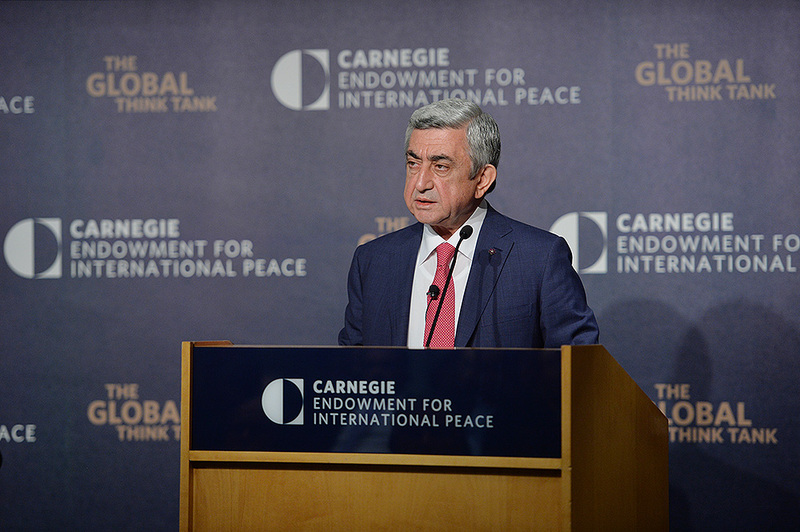 Serzh Sargsyan also reflected upon the Middle East crisis and Armenia’s approaches to that issue. 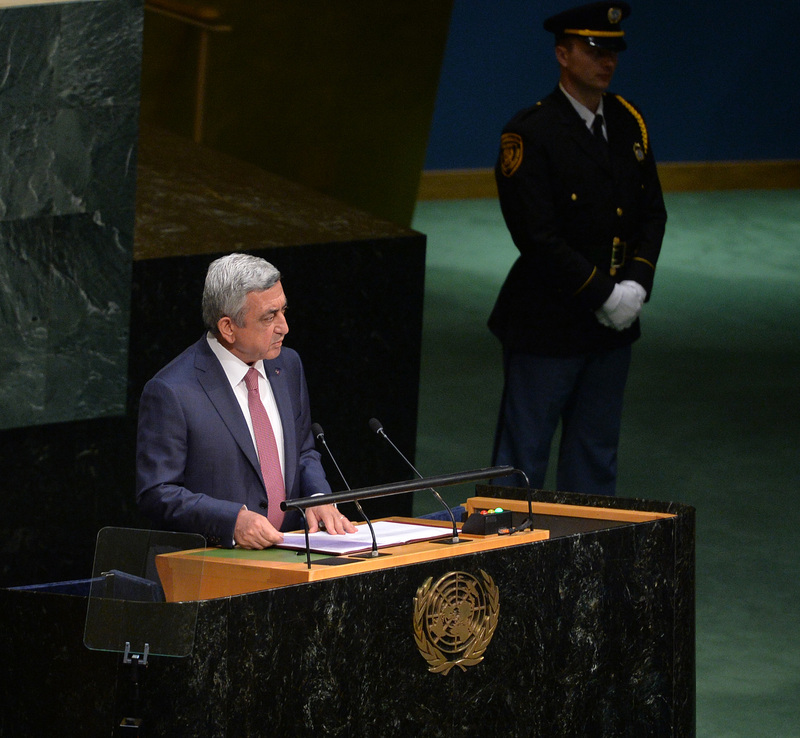 Armenia’s president presented the status of ongoing reforms being implemented in Armenia with the support of its European partners, the process of RA constitutional amendments and the logic of changes envisioned in the Draft Constitution. 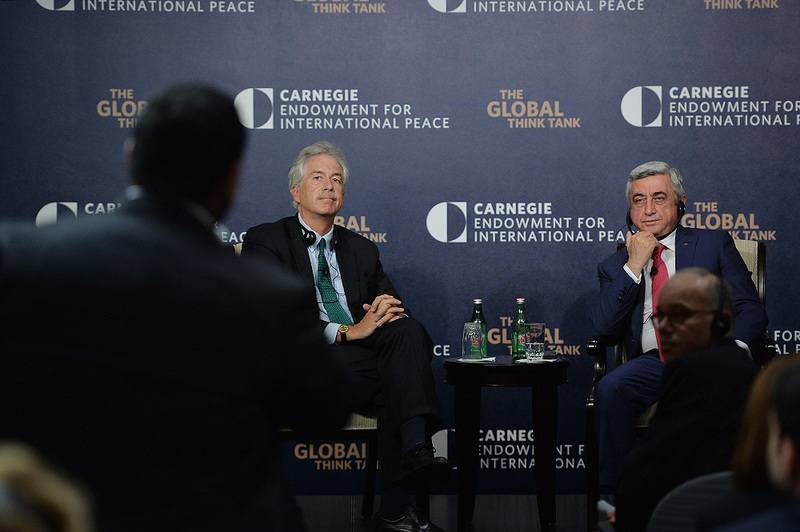 Serzh Sargsyan responded to multiple questions from the discussion participants, touching upon, inter alia, issues on Armenia’s socio-economic development, our country’s policy to ensure steady economic growth through getting involved in different integration processes, and upon the prospects of Armenia-Turkey relations. 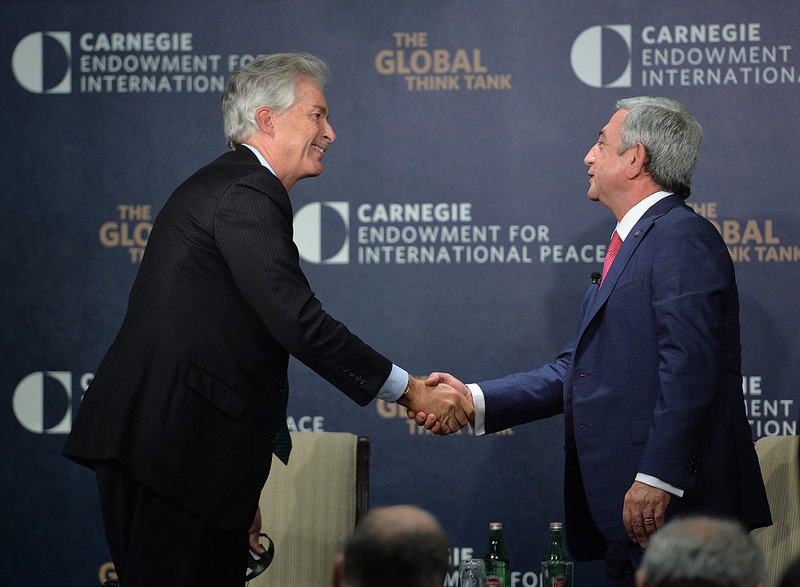 Serzh Sargsyan also had a private conversation with William Burns, president of the Carnegie Endowment for International Peace.